Like many of you, I’ve been to Niagara Falls (the good side, at least) and it is an amazing sight – the actual falls, not the cheesy tourist strip. I was wowed and impressed by the power and majesty of it all and even got super-soaked and misted in my blue poncho. But, there are certain individuals out there, unlike you and I, who – when they lean against the same railing watching 84, 760 cubic feet of water per second descend down 187 feet – think, “I want to kayak down that!” We all have dreams, right? And sometimes we live them out with the support of our friends, family and a film crew. Well, at least the ambitious and insane folks in “Chasing Niagara” can say that. Such a dreamer is Rafa Ortiz, a professional kayaker (I didn’t know that was a profession either) from Mexico who got together with fellow extreme whitewater kayaker Rush Sturges and decided to embark on a three-year journey to “run” (which is what they call going over a waterfall in a kayak) one of the three waterfalls that comprise Niagara Falls. How exactly does a pro kayaker and his colleagues/friends prepare for such an intense and highly illegal goal? That’s what you’ll find out in this documentary directed by Sturges using multiple GoPro cameras, Red Dragons, GSS/Cineflex systems, helicopter and drone footage and a slew of extreme sport sponsors such as Teva, GoPro, Redbull (to name a few), from Red Bull Media House in association with Sturges’ video production team, River Roots, based out of White Salmon, Washington, where Sturges lives. Obviously, training is everything for such a mission and that’s what primarily consists of the bulk of “Chasing Niagara” and what’s most important is the team assembled for the training. 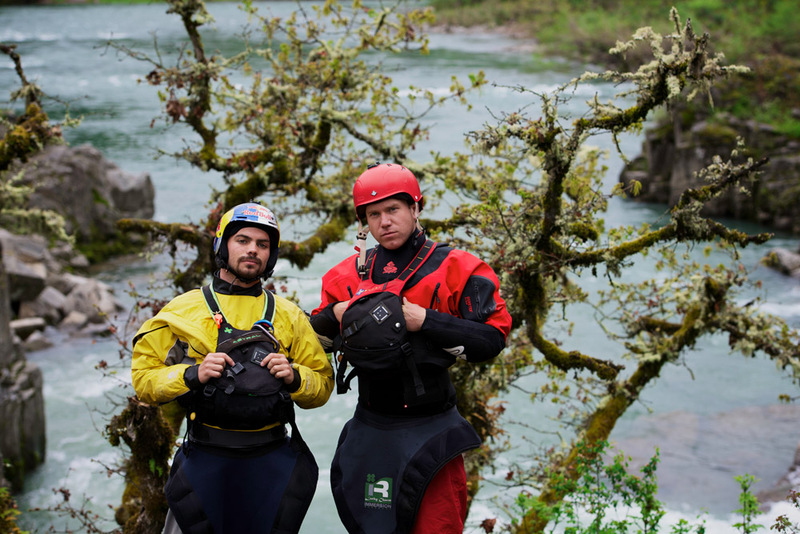 Ortiz (star of Red Bull Chasing Waterfalls) chose Sturges (named 1 of the 20 greatest outdoor athletes by Outside Magazine) as well as Evan Garcia (Canoe & Kayak Magazine’s 2013 Male Paddler of the Year) and brothers, Gerd Serrasolses (The Association of Whitewater Professionals’ Whitewater World Series Champion in 2013) and Aniol Serrasolses (Survivor of the 10-story/115 feet plunge from Keyhole Falls in British Columbia), for this bold endeavor. Most of their training took place in the lush rainforests of Mexico, near where Ortiz grew up on his family’s coffee bean plantation near the Sierra Madre Occidental. Much of the training took place at Tamato Falls in Vera Cruz, Mexico, since its waterfall is most similar to Niagara as well as locations in Chiapas, Mexico. Not as tall or as wide as Niagara, but Tamato is close enough for them to conduct multiple test runs. 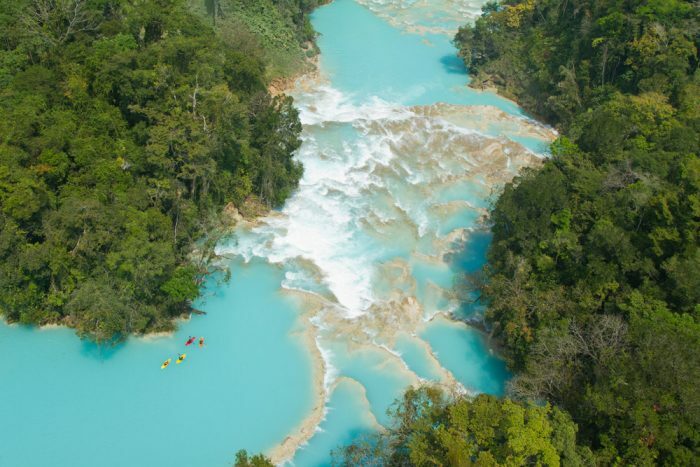 During these beautiful locations, we hear Ortiz, who narrates “Chasin Niagara”, go into some how-to methods in approaching waterfall kayaking. 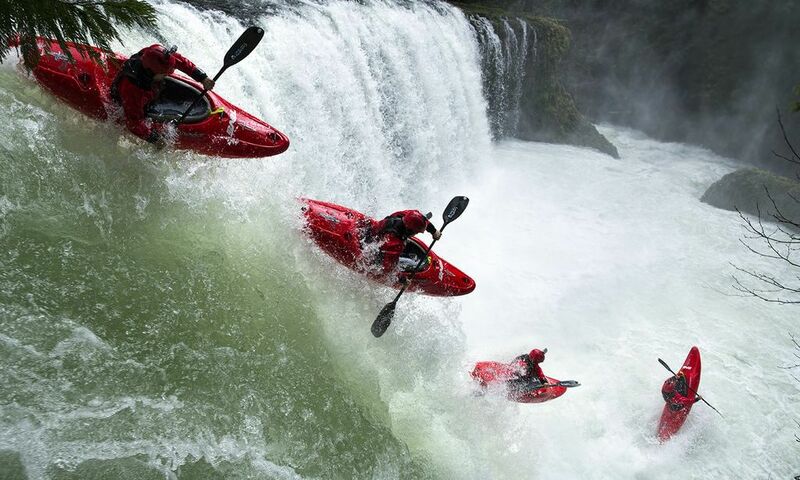 He states that on shorter drops (under 40 ft. high), he recommends ‘boofing’ – known as the art of keeping the bow of your kayak from diving underwater and landing flat at the base of the fall – but, on longer falls with a bigger drop, the goal is to try to lend at a 45 degree angle, so the kayak will land at the bottom like a bullet, with less impact on the kayaker’s body (after all, there’s potential for severe back injuries). As for the paddle, some kayakers toss it forward and catch up with it later, while others try to hang on to it. All of these impressive moves are shown in several perilous slo-mo clips. 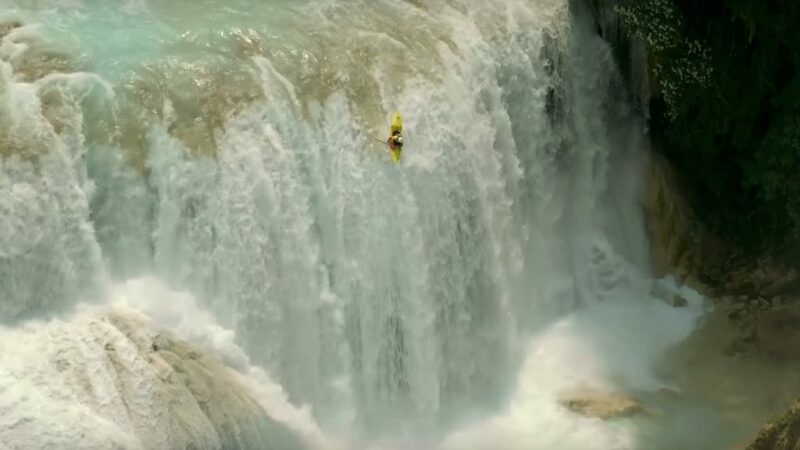 Ortiz explains how kayaking waterfalls is an art form of art, involving a ton of considerations – one doesn’t just nose dive down without a set of plans. Therefore, the kayakers here, as experienced as they are, must examine every aspect of the water – boils, currents and hazards are studied, in order to visualize what the course will be like and the variable outcomes. Ultimately, when running a waterfall in what is close to a 90 degree drop, every consideration must be made in order to assure little to no bodily injury for the kayaker. In the case of the Niagara Falls, a challenging location many have taken on and failed, the goal here isn’t just preventing injury but rather ensuring survival and discerning the best way not to die. About 20 minutes into the film, Sturges starts the countdown as “362 Days til Descent” appears on the screen with a serene shot of Niagara. It’s at this time that the trio involves fellow kayaker world-record holder, Tyler Bradt, who admits what they are planning to do is similar to the prep for a diamond heist, especially considering security around the falls is pretty tight and it’s basically a criminal act to run the falls – even if it’s for a documentary. With a location such as Niagara, it’s not hard for these four guys to hide their reconnaissance by blending in as tourists – taking helicopter tours and ferries in the water where Ortiz will land, in order to take in everything they must consider. This way, they learn more about the history of previous runs down the falls, calculate all the risks as well as discover certain off-limits spots they may need to utilize – all of this to determine whether or not Ortiz’s fall would even be possible. While there have those who survived going over Niagara in a barrel in the past (going back to the 1930s), the last boater to attempt it was Jesse Sharp back in 1990. All that was found was his battered canoe, which is all the more reason for Ortiz to count the cost of his dream. Besides death, Ortiz also has to consider the legal ramifications he could be putting his friends in – the penalty for going over the falls can include jail time and a maximum fine of $10,000. Another thing to consider is the kind of media coverage the event would earn, regardless of the outcome and whether or not that’s something Ortiz and his crew would want. All of this is pondered over, but the training and camaraderie it brings, is mostly what the film covers. During the countdown and we see the mental, emotional and physical toll the preparation has on the crew – complete with several near-death moments. As the Niagara descent nears, training intensifies at Palouse Falls (189 ft. ) in eastern Washington and at Santo Domingo Falls, located in the southernmost jungle of Mexico. Along the being the director and close friend to Oritz, Sturges also serves as coach for the event after deciding that it was too much of a risk for himself to run Niagara. We see Sturges and Ortiz cover everything about their plans and even discuss some hard truths about the reality of it all. In it all, “Chasing Niagara” becomes a movie about the process of following a dream (something that can be appealing to anyone, not just kayakers) and the specific process of waterfall kayaking, which uses a different style, there are some technique basics to respect and observe. Ortiz and Sturges covers all of this and while it may be repetitive to viewers in-the-know, those like me who have in interest in kayaking, will find such an overview quite interesting. I’m not going to give away the ending of “Chasing Niagara”, but I’ll just add that it concludes in a logical and realistic manner. Those who wonder how such a doc could get greenlit by a studio, knowing full well the legal trouble that inevitably follows running Niagara, will see where it’s going. 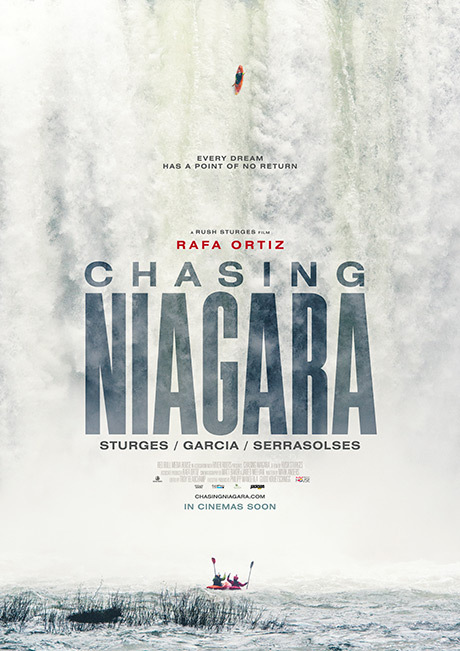 At one point, just covering the preparations and actual Niagara run was the point of the film, but that changes as Ortiz and Sturges both come to a realization that boldly holding on to dreams – on little sleep and a lot of fear and adrenaline – will provide some incredible and sobering memories. 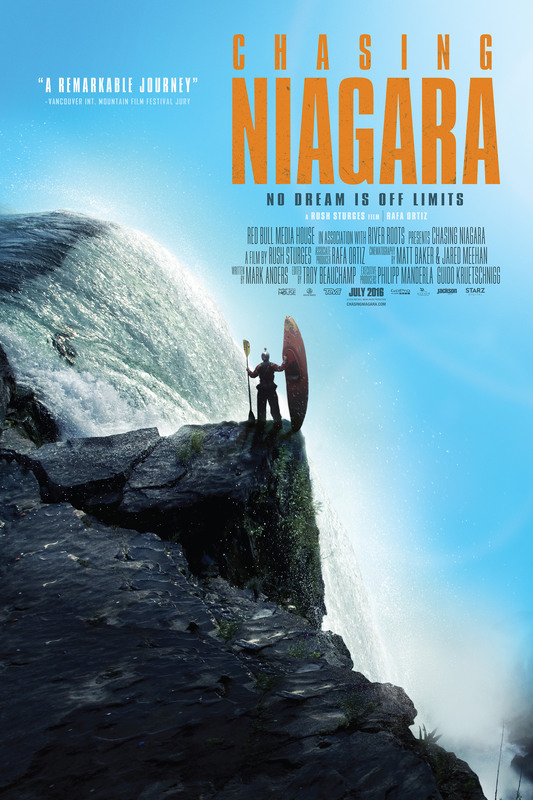 Making the most of life’s unpredictable twists and turns is truly at the heart and point of “Chasing Niagara”.